How much debt are Americans carrying? The table below is based on data taken from the Federal Reserve and shows the nature and amount of Americans’ debt in 2007. The third column shows the percentage of American families (perhaps more accurately referred to as households) that hold each kind of debt. 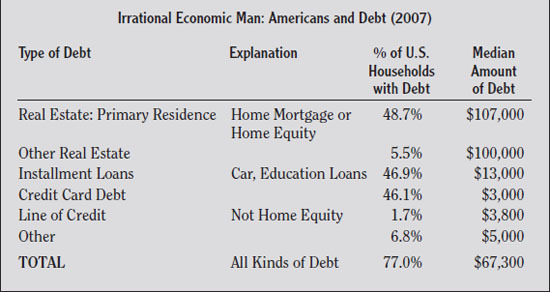 The fourth column shows the median amount of debt of the households that hold debt. Remember the median refers to the amount that equally divides the top and bottom half of the population.